Life has been kind of difficult lately, and I have been struggling to find happiness on a day to day basis. I won't go into all the gory details, but just believe me, this past year has brought so much heartache and strife I don't know what to do to get past it. I've been searching for some sort of meaning and purpose, searching for ways to be happier, looking for MORE (there's that one little word again!). 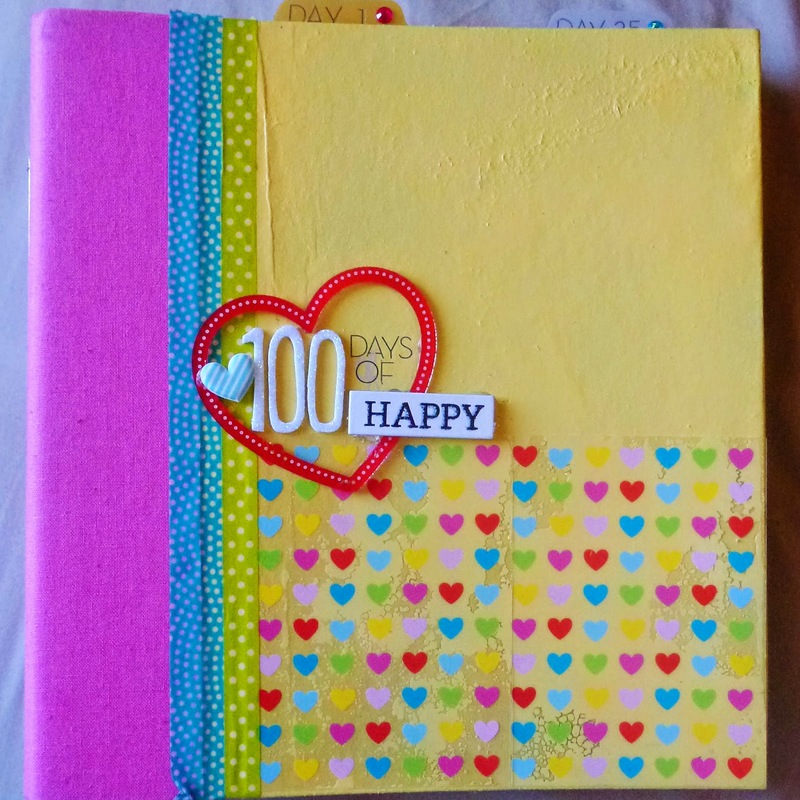 In my search I came upon a challenge called 100 Happy Days, and I decided I would take up the call and try it. Basically it challenges you to take a picture, every day, for 100 days, of something that makes you happy. I loved the idea, and it seemed like a good way to try and see the happiness in my life in a time that I am struggling. At the very least, I figured that if I finished it, when I was having a hard time in the future I could look back on it and tell myself if I could find happiness during this hard period of time I could get through whatever else came my way. So here is the album I came up with to document these 100 days of happy. The cover overall. Learned a lot from this. I used a Simple Stories SN@P album in pink. I spray painted the kraft with a yellow gloss paint (which was not my best idea ever, but it did the trick. I then attached two little heart overlays from the February freckled fawn Oh Deer Me kit. I used a cute acrylic heart frame from their December kit as well, and a little puffy sticker from January's kit. They seriously have the cutest stuff! I used various thickers and rub-ons to add the title, along with a chipboard "happy" from some Mambi chipboard stickers I had. I have to say I SUPER LOVE IT ALL! it turned out so cute! My cute title page, the pictures are from a photo booth. I then decided I needed a title page. I used one of the journal page inserts that comes with the SN@P album and then went in search of a sketch to use as an idea for jumping off. I found this sketch from Colorful Creations to use and love how it turned out. It was such a fun sketch to work with. 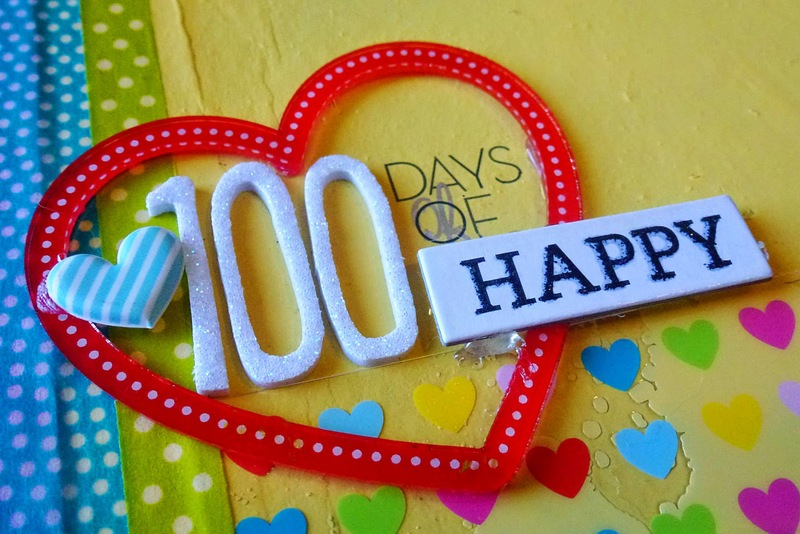 The back of the page will have an explanation of why I decided to take up the 100 Happy Days challenge. I used cards from The Project Life Slate and Just Add Color kits, some washi tapes from walmart of all places, a vellum sticker from the November Oh Deer Me kit, a puffy sticker from the January kit, a resin cameo from the February kit, and a "what a fun moment" banner from the March Kit. I also used some wood chips from Micheal's and some homemade enamel dots made from perler beads (tutorial possibly coming soon, if I remember). 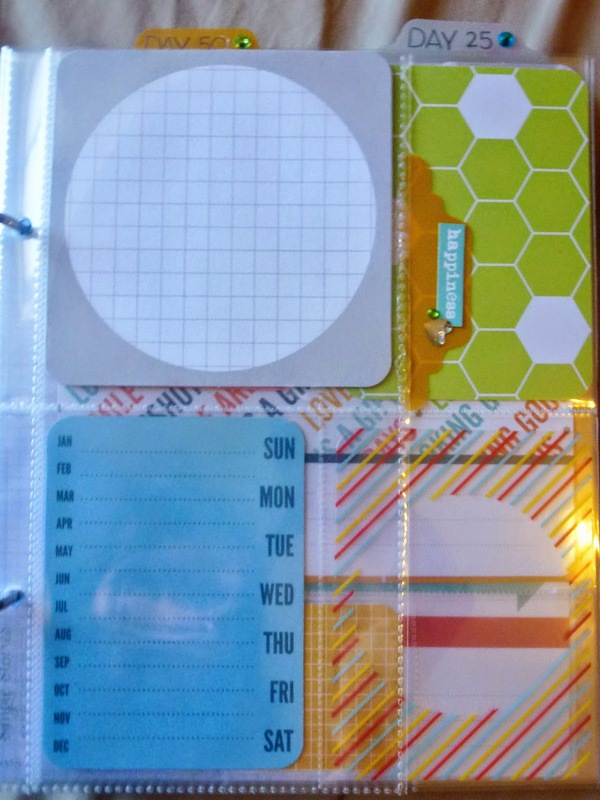 I then filled the binder with a bunch of blank cards and page protectors to add to throughout the project. I haven't added any pictures yet, but I plan to soon! I am excited to take up this project, and hope it will help put me in a better frame of mind. Trying hard to get back to the happy me! WOW!..Love what you did-it is colorful, cheerful and well...H-A-P-P-Y!...Really hope you find yours-the positive way with which you're going forth says--yes you will!!!! Thank you Marci! I really wanted it to be happy and cheerful, because it's something I want to be looking at and adding to regularly. I figured the happier it looked, the happier it would make me to look at it! Love how you used the sketch! Thanks for playing with us at CC. So colorful, I love it! Thank you for playing with us at Colourful Creations! Fantastic work with the sketch! 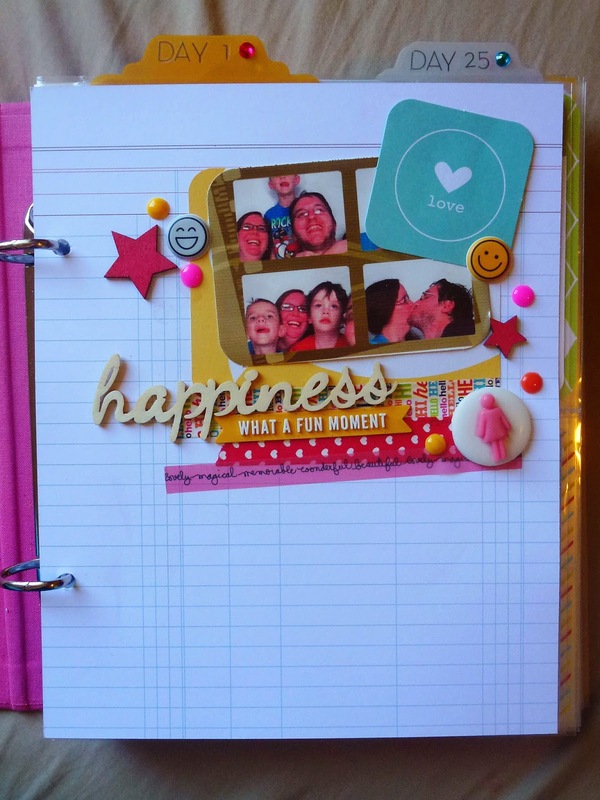 Love your "happy" page! Thanks for joining us at CC! Great use of the sketch!!! Love this! Great use of the sketch! Thanks for joining us at CC! what a happy page !!! !I love the embellies!!!! thank you for playing with us at CC!!! Such a happy, colourful page!